The 4th Annual Masters of Color Photography Awards were announced just over a week ago and I’m very happy that one of my images has been nominated again in the Professional Photojournalism section. 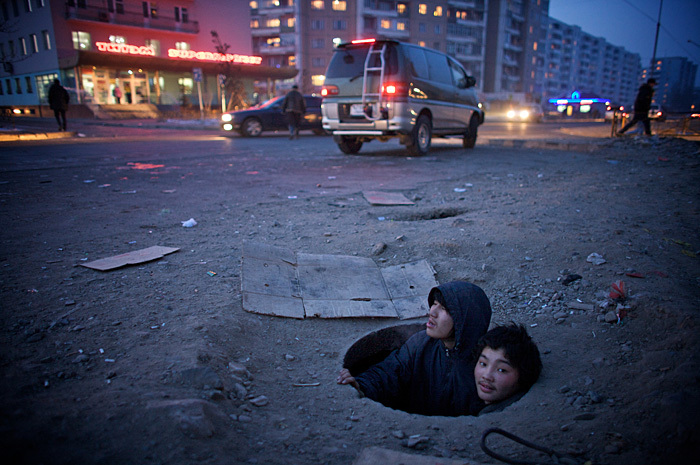 Last year a picture from Afghanistan was nominated and this year an image from the Mongolia story has been recognised. Finally back in Perth after a very busy 6 weeks away working on 3 assignments in Palestine, Cyprus and Liberia which was exhausting but amazing. My project in Cyprus was cut short by a week after Cafod asked me to go to Liberia for a job at the last minute so I hope to return soon to complete this. 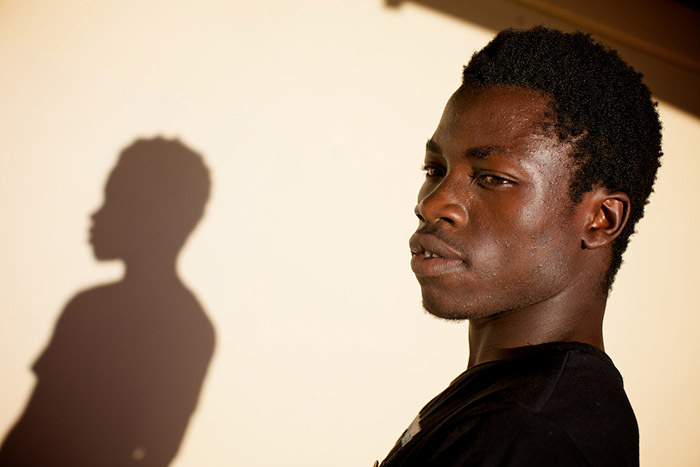 I’ll be posting some images from Liberia in the next few days. These images from Cyprus continue the theme of my long term project about Borders and Barriers around the world that separates communities. 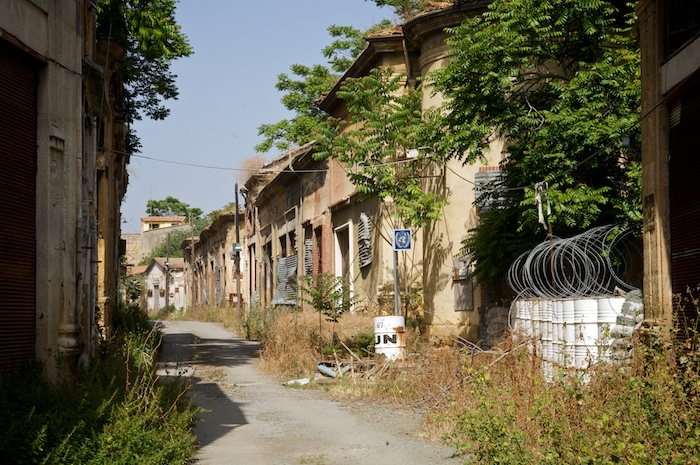 The main focus of the story is the divided capital of Nicosia where the so called ‘Green Line’ or ‘Buffer Zone’ was drawn in 1974 during the height of hostilities. 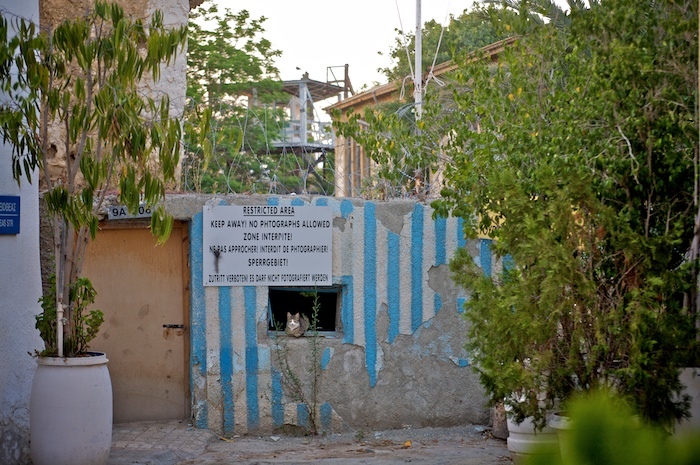 In some sections the buffer zone between the Greek Cypriots and the Turkish Cypriots is only a few meters wide. Greek and Turkish troops agreed to pull back from these inflammatory positions in 1989 and the zone is patrolled by UN Peacekeepers who have been in Cyprus since 1964, making it one of their longest running missions. 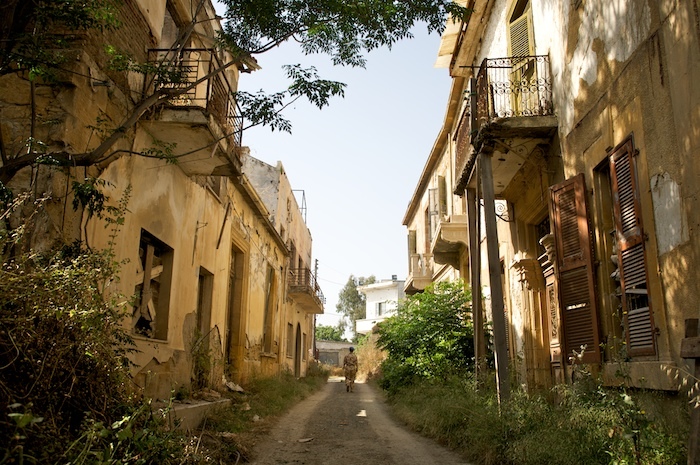 Nicosia is quite a surreal place. It has a look and feel of any other thriving Mediterranean city and via a number of checkpoints it’s easy for Greeks, Turks and tourist alike to cross over to either side. Running through the centre however is the Buffer Zone, a no mans land where homes and shops have been left abandoned and decaying since 1974. If you approach the dividing line on either side you’re likely to come across armed Greek or Turkish soldiers in bunkers and lookout posts. Dead end streets lined with concrete filled painted oil barrels with signs strictly prohibiting photography mark the border. It has a look and feel of a nation at war but the line has been peaceful for years. Walk just 10 meters back from the line and you can be sipping a beer in a neon clad café just like any other tourist spot in the world. I was very lucky to get access there as very few people are allowed to enter and even UN troops aren’t permitted to take pictures. 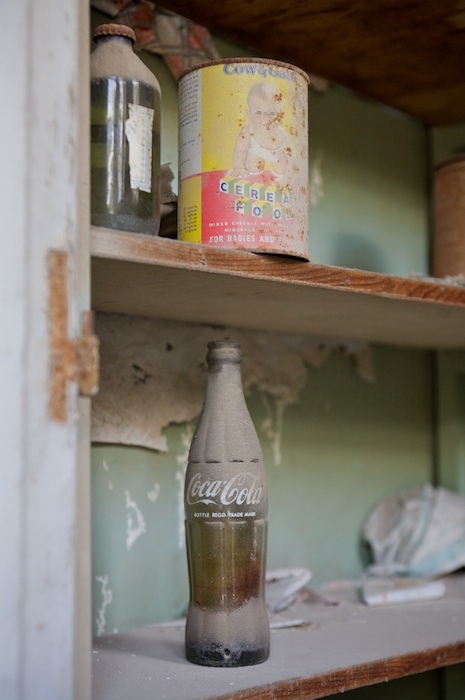 This eerie, derelict, bullet ridden strip of former shops and homes is a fascinating place. I hope to return to finish off the project by interviewing people who had to flee either side of the green line during the war. 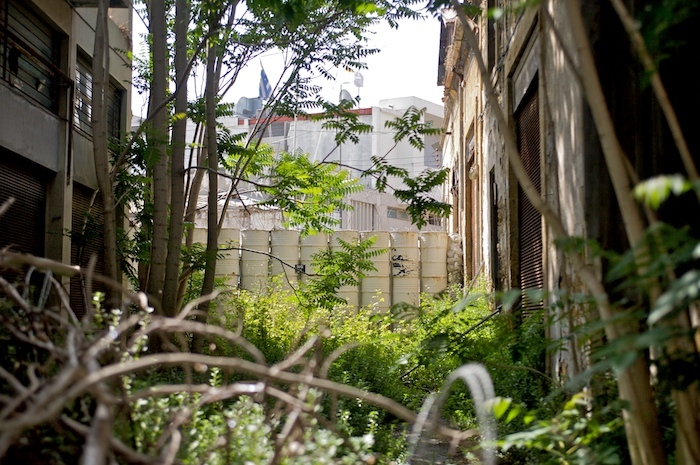 A UN peacekeeping soldier patrols the narrowest section of the UN controlled Buffer Zone or the Green Line in the divided city of Nicosia on the island of Cyprus. 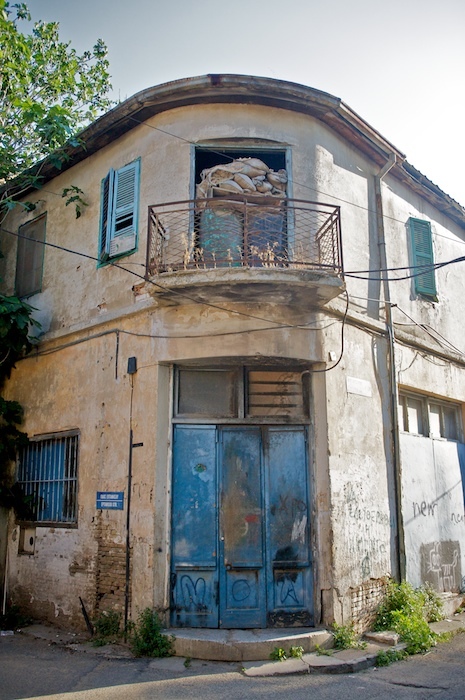 Since 1974, abandoned shop fronts and houses just metres apart have became the front line between the Greek-Cypriot southern region and the Turkish-Cypriot northern region. Soldiers have now pulled back from these positions to help relieve the tension between both sides. 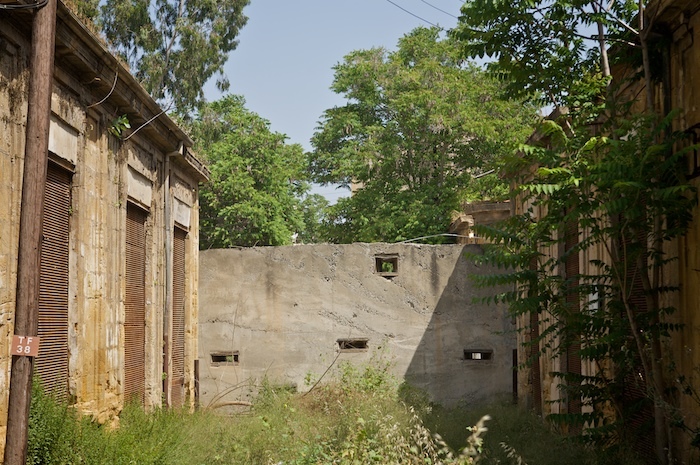 Highly restricted and inaccessible to all but UN personnel, the decaying buildings have remained untouched and left to ruin for over three decades. 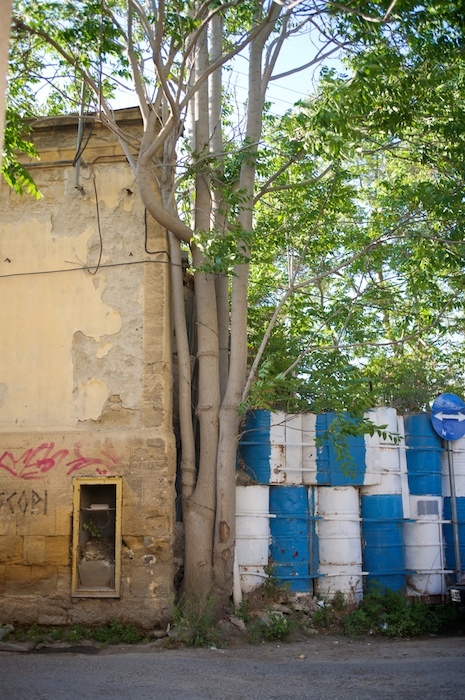 Cement filled oil barrels block off streets to the buffer zone from the Greek side. Brick walls with viewing ports mostly form the barrier on the Turkish side. 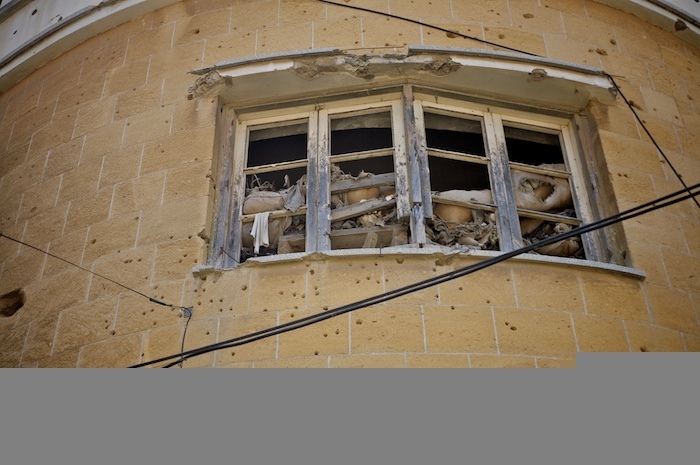 Sand bags fill windows of a building on the front line on the Greek side of the buffer zone. The bullet holes reveal the intensity of the fighting that took place in this area. With no one allowed into the buffer zone except UN peacekeepers the buildings have fallen into disrepair and nature allowed to take over. Many people living in the area fled during the fighting and have never returned to their homes. Personal possessions still remain in a virtual time warp from 1974. Access to the buffer zone is strictly prohibited. Both Greek and Turkish troops either side of the zone keep watch and UN peacekeepers patrol the centre. 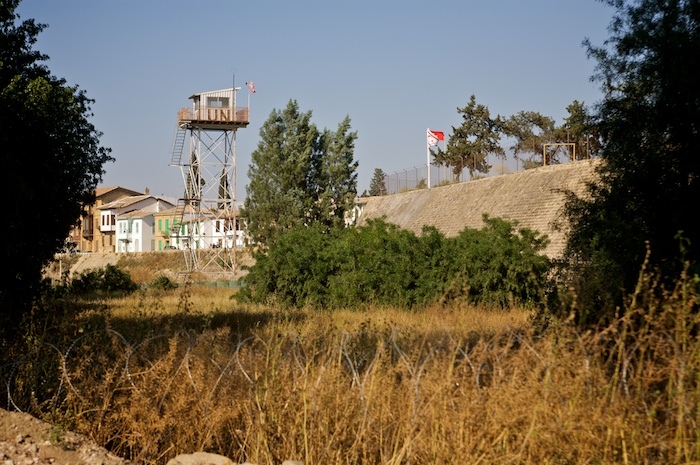 The Buffer Zone from the Greek side marked by painted oil barrels and observation posts. 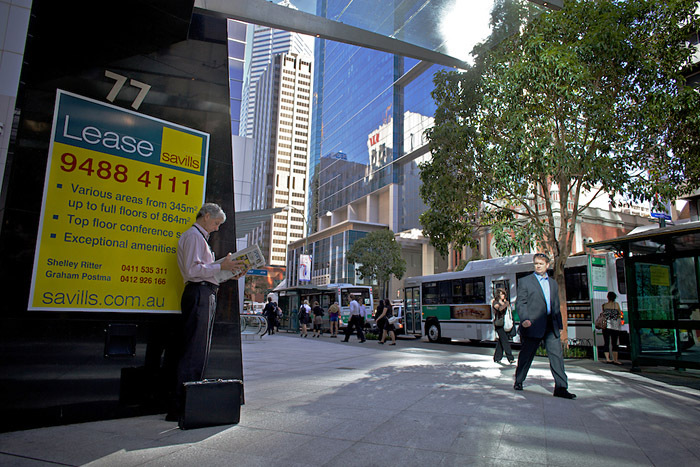 Whilst industrial businesses operate close to the line few people live within the immediate area. 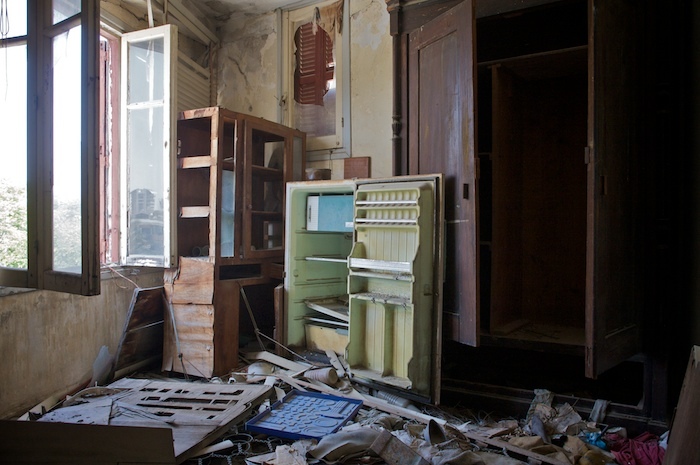 Abandoned and war damaged houses are found all along the Greek side of the zone. UN watch towers can be seen all along the buffer zone but since a decrease in hostilities not all are manned these days. 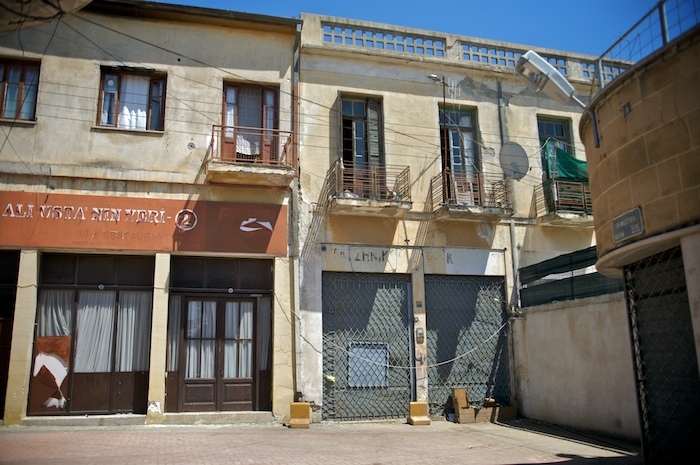 A street with shops and apartments suddenly comes to a stop by the buffer zone wall on the Turkish side. 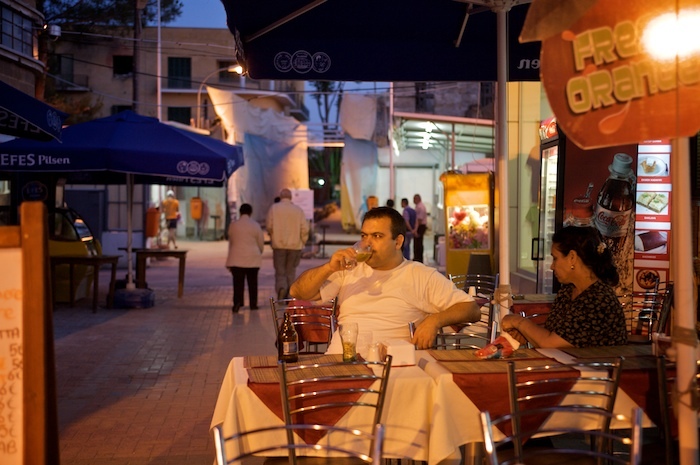 A customer in the northern Turkish part of Cyprus enjoys a beer just meters from the buffer zone with the Ledra Street crossing seen behind. Since 2003 it has been possible for both Greeks and Turks to cross the buffer zone at designated crossing points and visit either side of the Island. 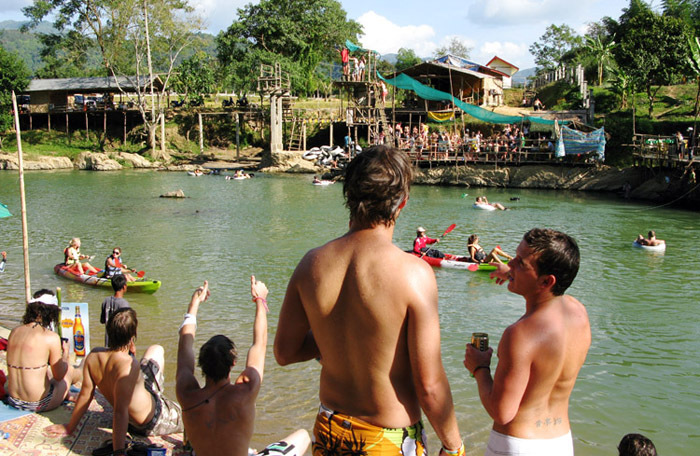 Tourists can pass through after showing their passports. Either side of the buffer zone life and commerce continues as normal adding a surreal atmosphere to the place. 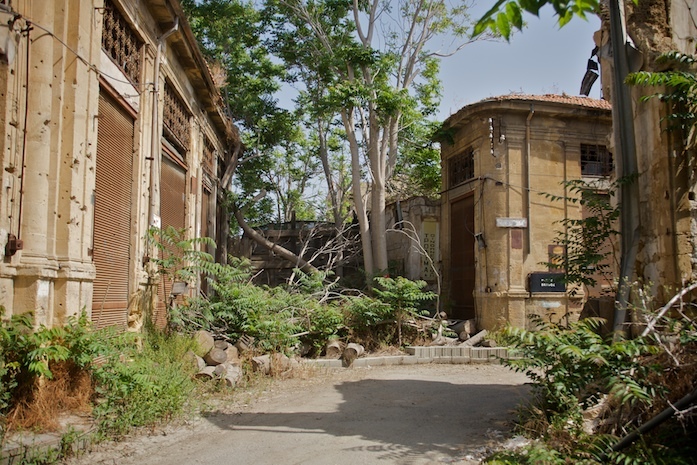 The buffer zone extends over 180km across the Island and whilst only a few meters apart in Nicosia it can be a few kilometers wide in other parts. 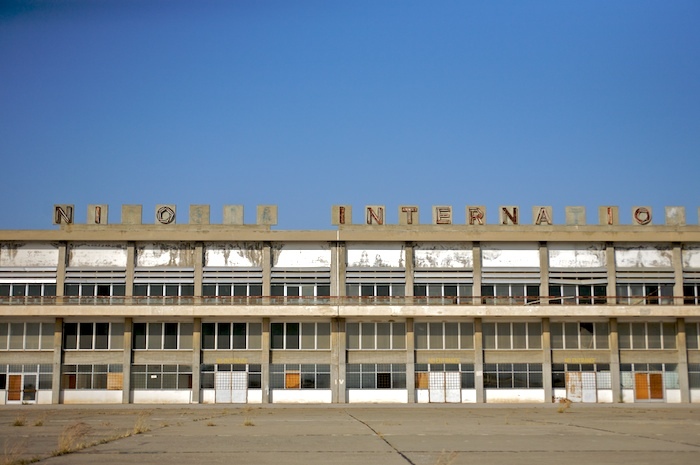 Nicosia International airport was a scene of heavy fighting and was declared a United Nations Protected Area in 1974. It has remained unused since then and is now home to roosts of pigeons. The departure lounge covered in pigeon droppings. 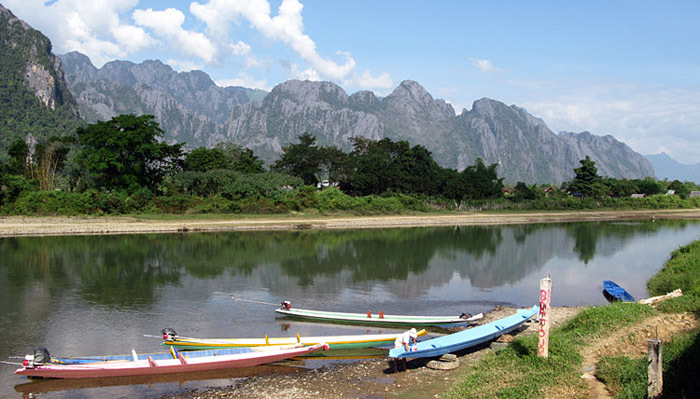 With a thriving tourist industry the airport was modern for its time before closing during fighting in 1974. 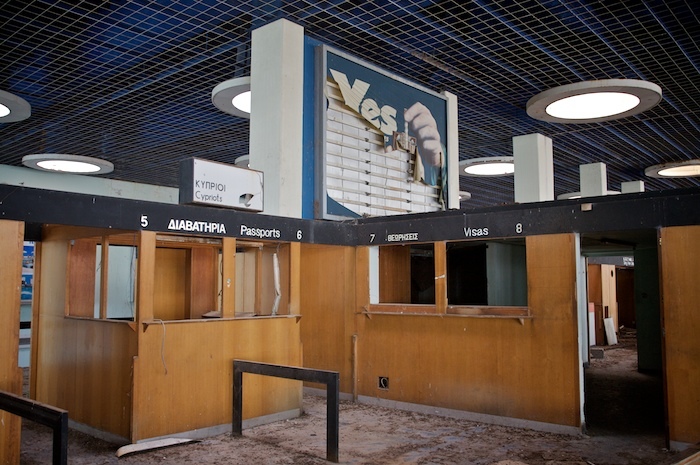 Passport control booths remain unused since 1974. 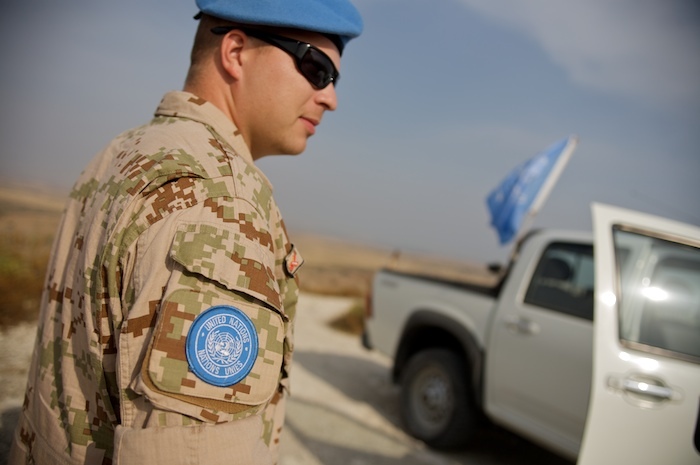 UN peacekeepers from Slovakia maintain watch in the southern sector of the buffer zone. Whilst there is no physical barrier in this section entry is strictly prohibited without prior permission. 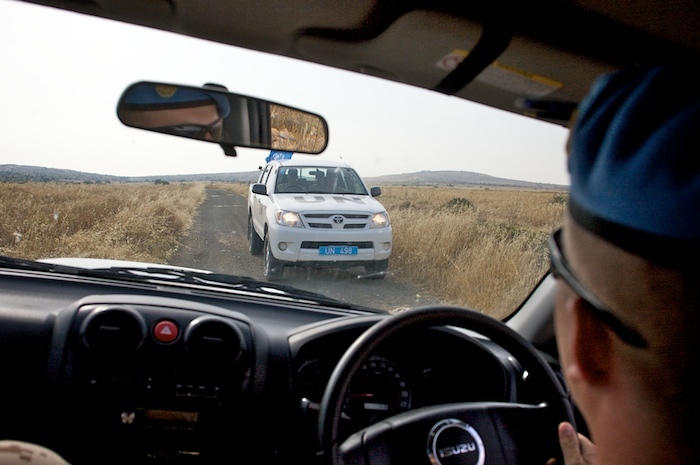 UN peacekeepers patrol the buffer zone in the southern sector. Farmers are allowed onto the land with prior permission. 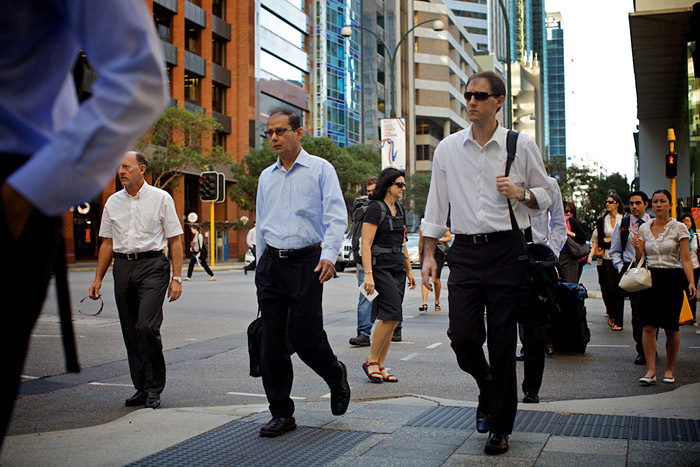 There are over 10,000 people allowed to live and work within the zone. 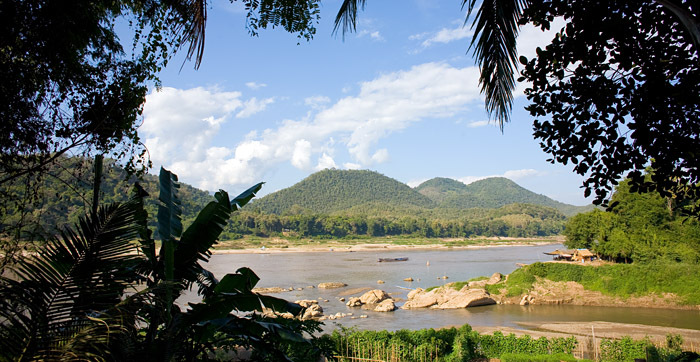 Many tourists and hunters enter the zone illegally, mostly by mistake. 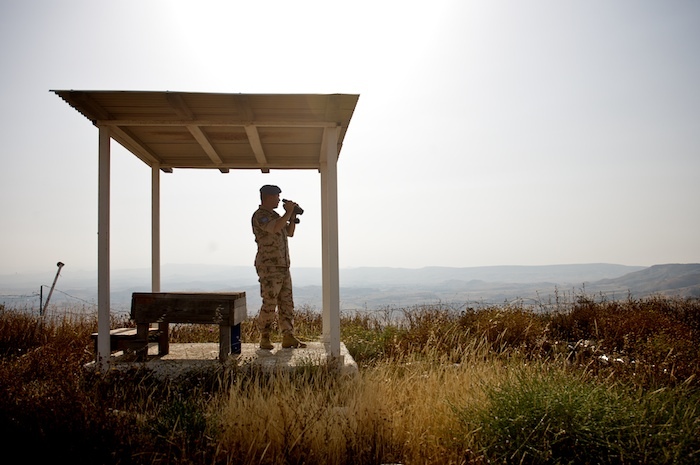 A UN peacekeeper looks out over the buffer zone towards the northern Turkish side of the Cyprus. 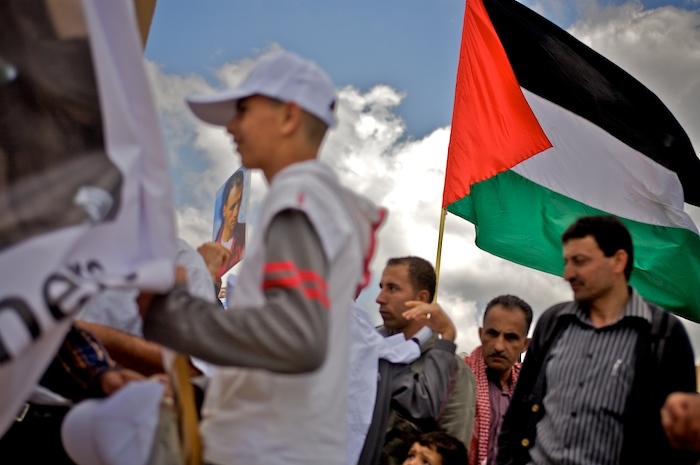 Just arrived back in Jordan from assignment in Israel and Palestine. This is the first part of a long term project about physical borders and barriers around the world that separate communities due to conflict, illegal immigration or territorial issues. I’ll be processing and editing when I’m back in Perth so below is just a quick view of what I’ve been working on. I’ll be writing a more comprehensive report and publish a fuller story in a few weeks. I’m off to Cyprus in a few days to continue the story there so will post again when I hopefully start shooting pictures on phase two of the project. 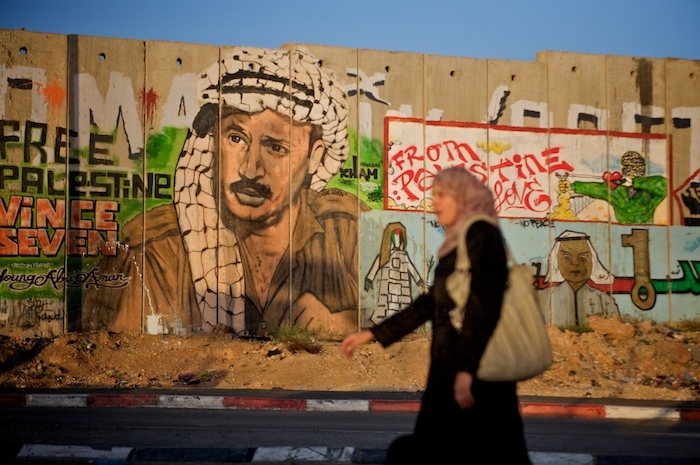 A Palestinian woman walks past a mural of the late Yasser Arafat painted on the separation wall at the Qalandiya checkpoint near the West Bank town of Ramallah. 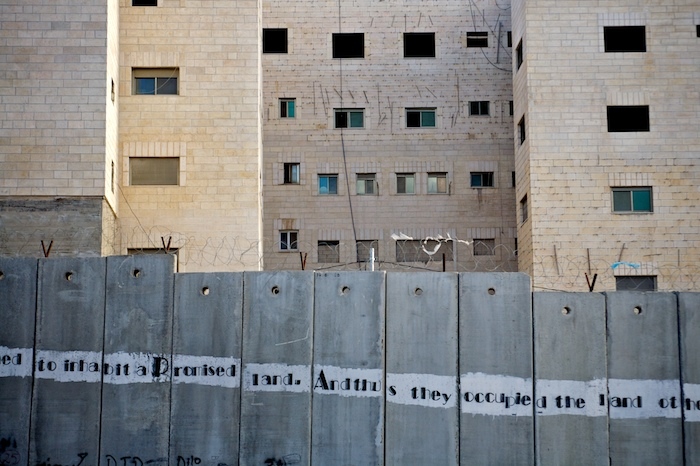 The separation wall which works its way into the centre of Bethlehem. 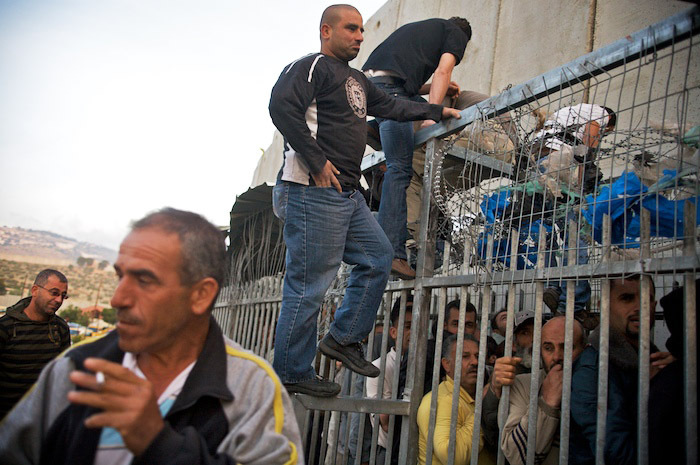 After queuing up since 4am Palestinians clamber to get into the checkpoint at Rachel's Tomb in Bethlehem to get through to work in Jerusalem. A schoolboy gets lost in the crowd as people try and push through the checkpoint in Qalandiya. The wall separated many children from their homes and schools and they now have to spend hours each day going through the daunting checkpoint procedure to get to school. 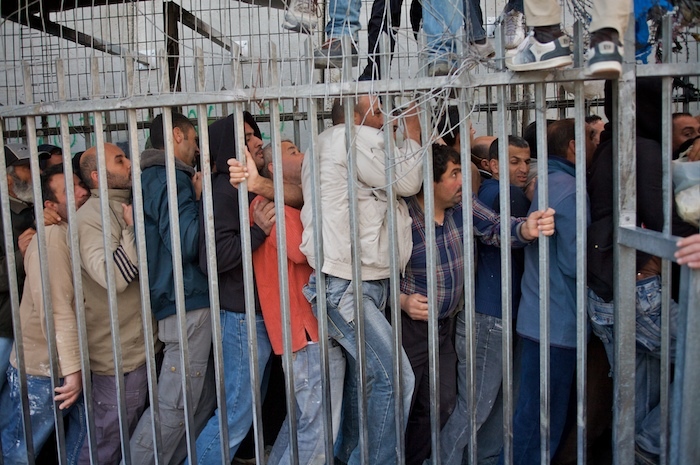 As the checkpoint is finally opened at 6am, Palestinian workers surge forward, crushing everyone within the cage at Rachel's Tomb in Bethlehem. 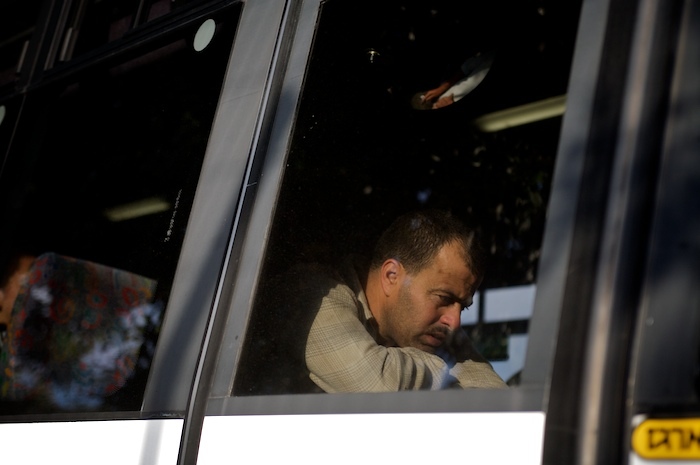 A Palestinian worker sits exhausted on a bus waiting to take him to work in Jerusalem after queueing up at Rachel's Tomb checkpoint in Bethlehem for over 3 hours from 4am. 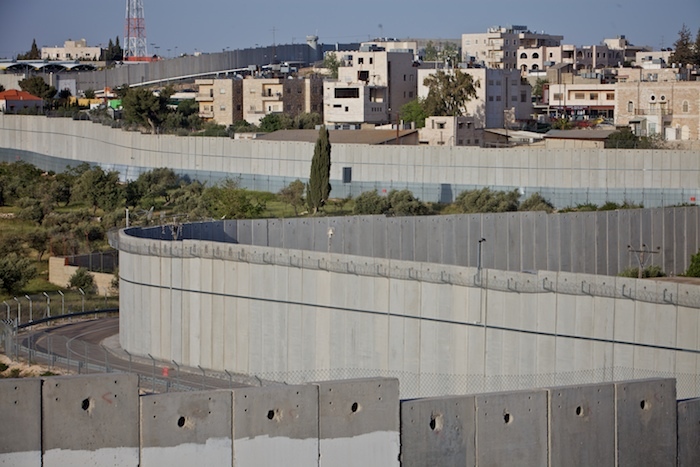 The separation wall between Palestine and Israel in Ar Ram near Ramallah looking into the Jerusalem region of Atarot. 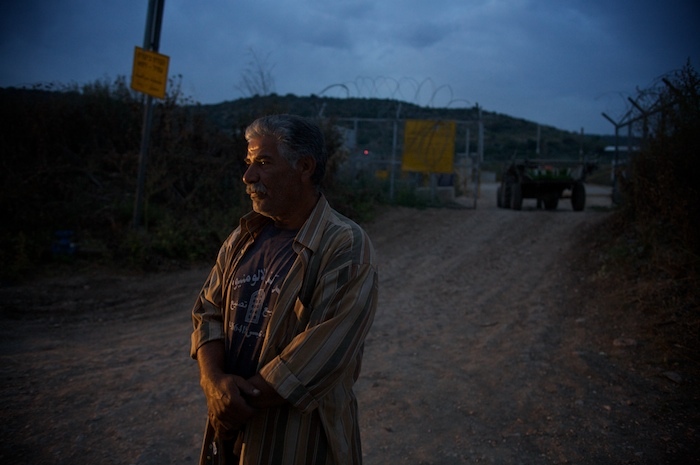 A farmer waits for the agricultural gate at Attil to be opened by IDF soldiers. 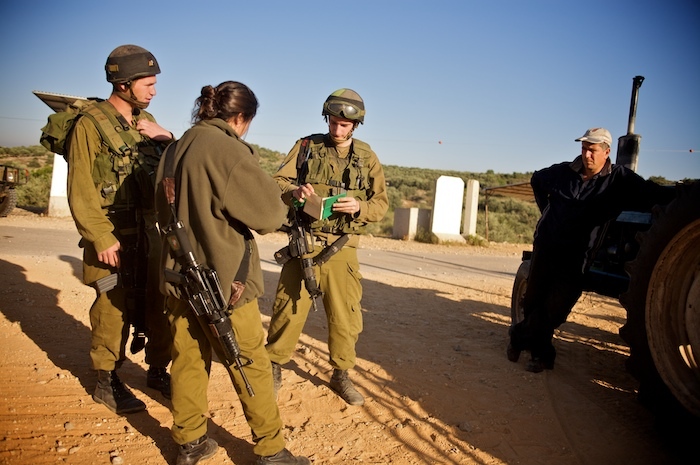 IDF soldiers open North Gate, an agricultural access gate on the separation barrier in the village of Jayyus. The gate is opened 3 times a day for about 30 minutes each to give farmers access to their land they have been separated from. 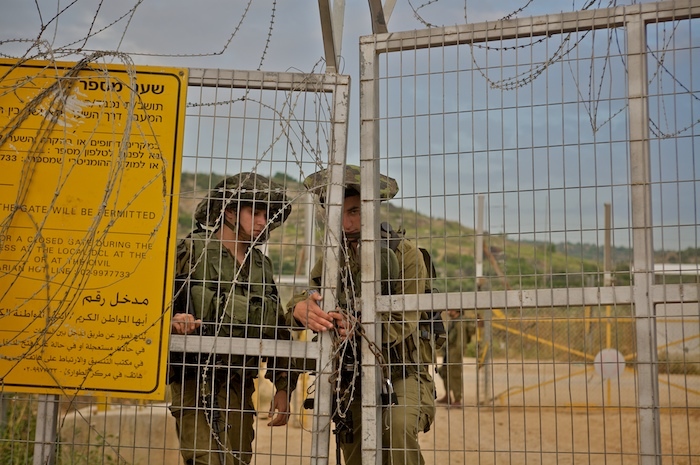 IDF soldiers open North Gate, an agricultural access gate on the separation barrier in the village of Jayyus. The gate is opened 3 times a day for about 30 minutes to give farmers access to their land they have been separated from. They are effectively trapped their until the soldiers turn up again to open the gate and let them back to their village. 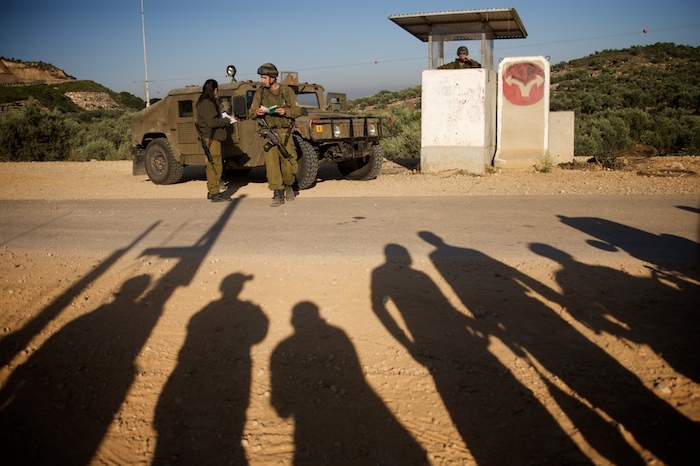 IDF soldiers close the Attil agricultural gate in the separation barrier near the West bank town of Tulkarm. 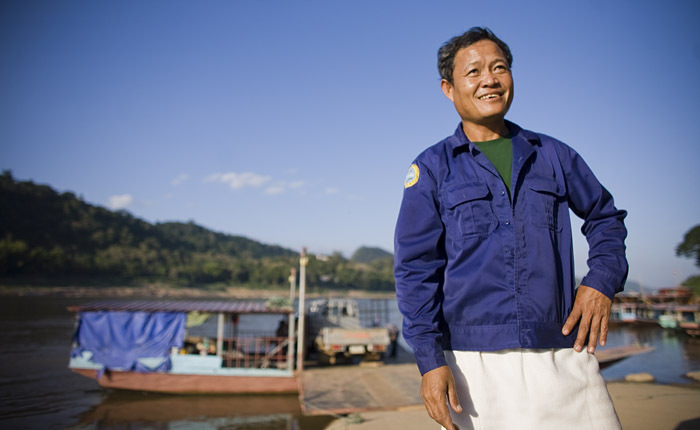 Many of the farmers have lost the majority of their land to the barrier and have to apply for permits to cross the barrier to work. Permits are often refused for no reason resulting in wasted crops and income difficulties for the farmers. 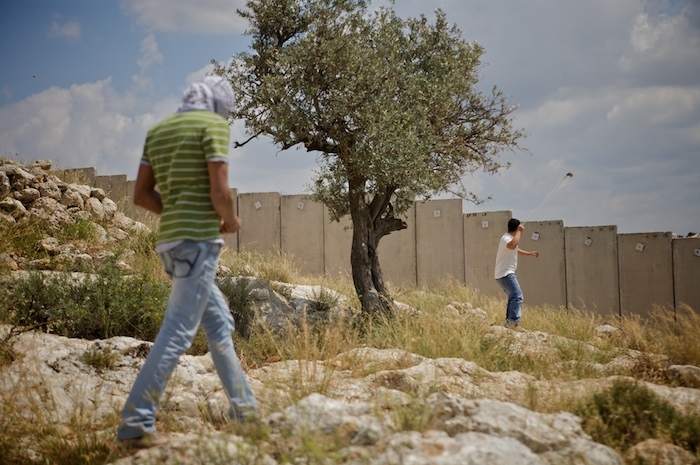 Teenagers play by the separation barrier walling off Aida Refugee Camp near Bethlehem. 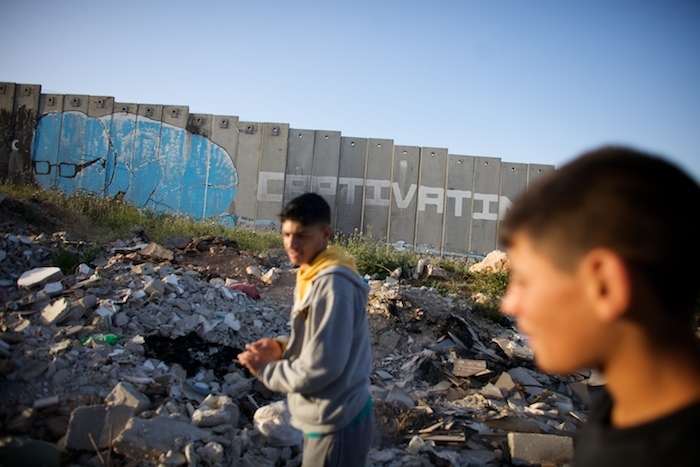 Protesters make their way to the separation barrier in Nil'in. Protesters throw stones over the separation wall at Israeli soldiers who reply with volleys of tear gas and live fire during the regular Friday protest in the village of Nil'in to demonstrate against land confiscation and the separation wall running through their land. 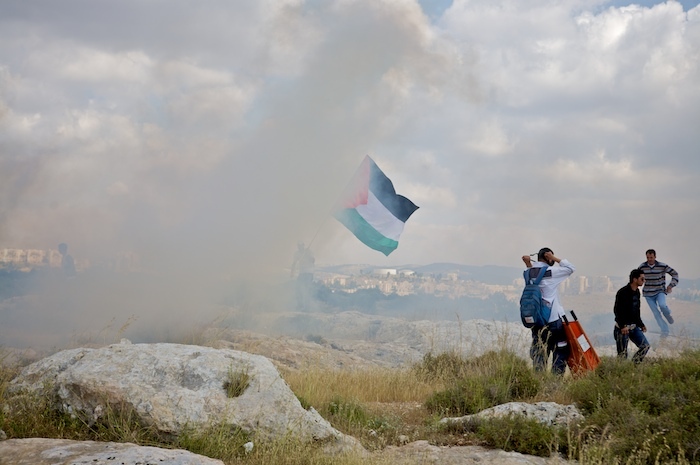 Residents and protesters try and escape clouds of tear gas fired by IDF soldiers in the village of Nil'in whilst demonstrating against land confiscation and the separation barrier. 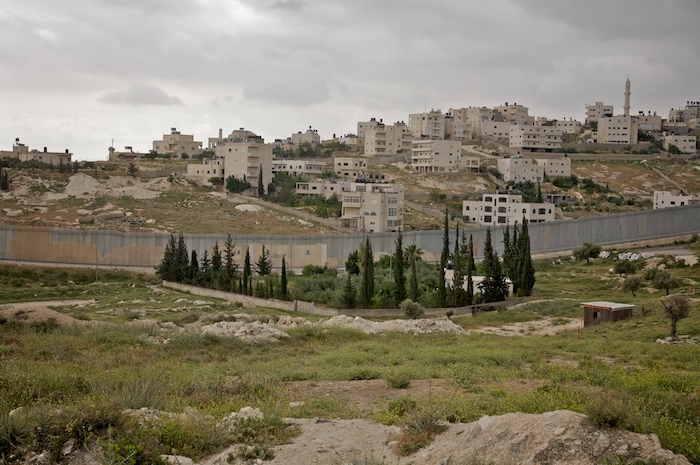 The separation wall between Palestine and Israel in Abu Dis near Jerusalem. 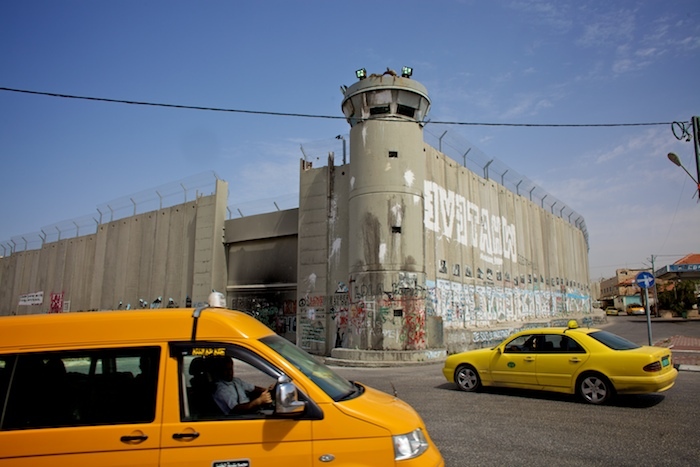 The separation wall winds its way around Aida refugee camp near Bethlehem. 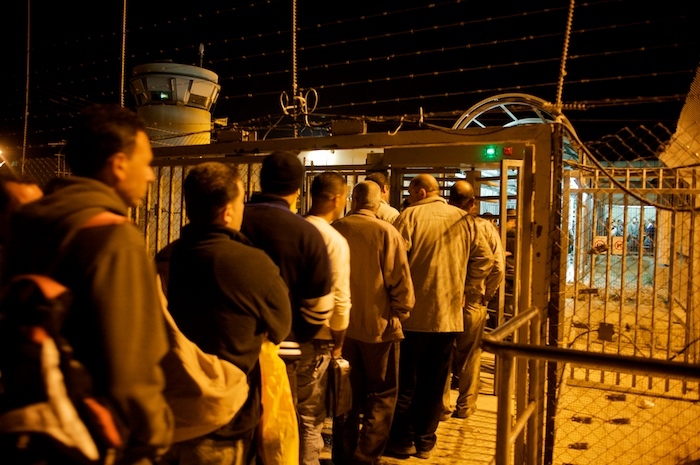 Thousands of workers from the Qalqiliya area arrive before 4am to pass through the checkpoint to go to work in Israel. 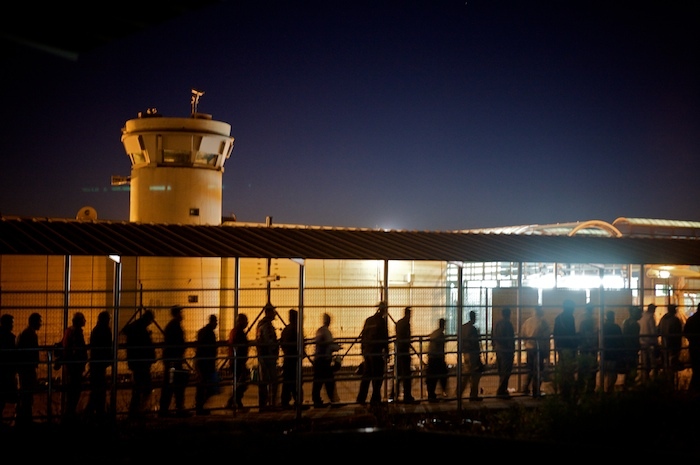 An Israeli check point at Qalqiliya. 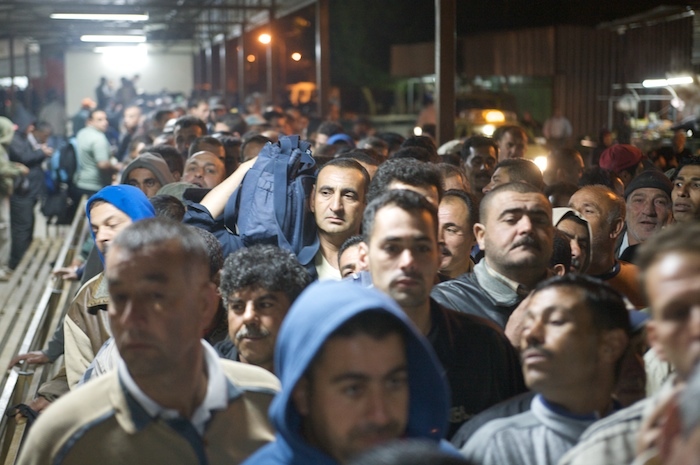 Thousands of workers from the area arrive at the checkpoint before 4am to pass through the checkpoint to go to work in Israel. 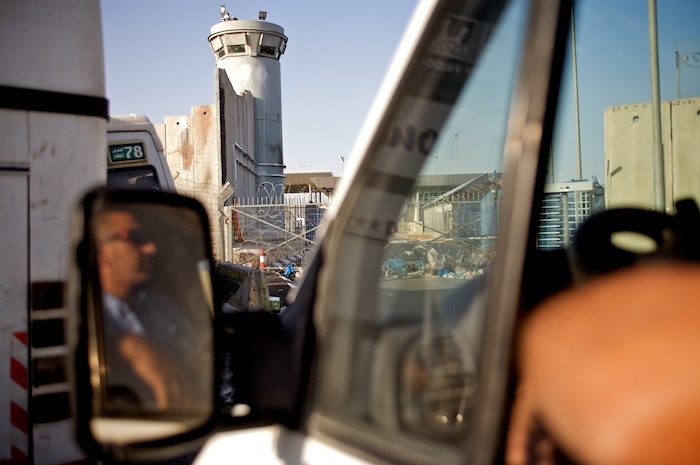 Palestinian taxis, buses and cars queue up at Qalandiya checkpoint to get through to Jerusalem to work. 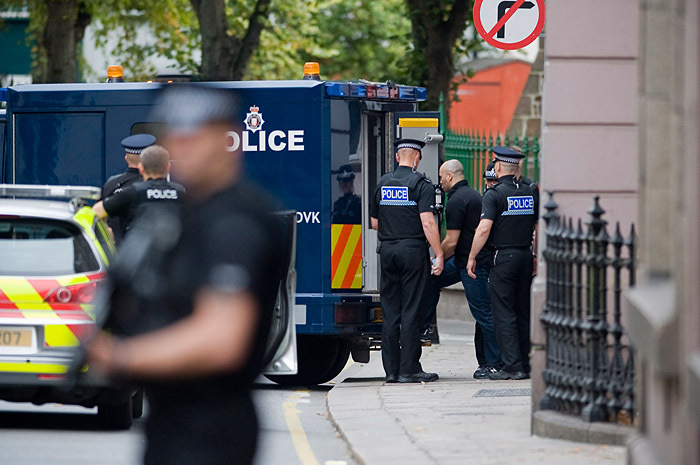 This process can take hours with no guarantee they will be allowed through. 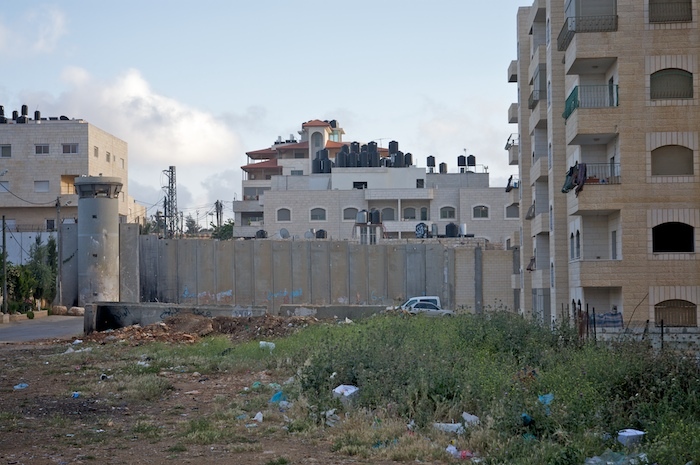 The separation wall and Israeli watchtower in a residential area of the West Bank town of Dahiyat near Ramallah. 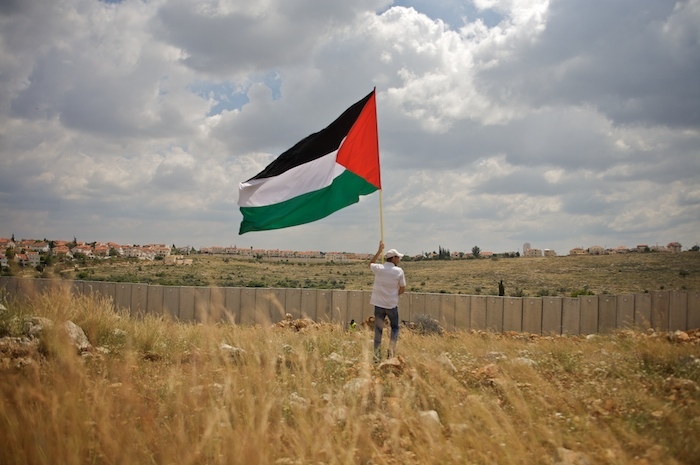 A protester flies the Palestinian flag at the start of the regular protest n the village of Nil'in to demonstrate against land confiscation and the separation wall. It’s been a challenging, intense and thought provoking week and thoroughly worthwhile. If I ever doubted the effectiveness of photography workshops that skepticism has certainly been laid to rest. 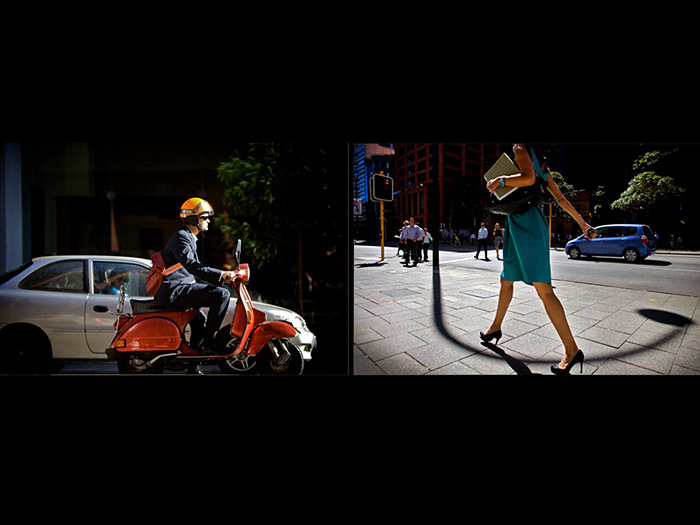 My tutor, Magnum photographer Bruno Barbey, managed in 5 days to make me completely reconsider how I shoot, edit and sequence photo stories in a very subtle way. It was an education watching him edit everyones work, showing us how just changing a few images, making each image lead and flow into each other can really make a story. Having the opportunity to sit down and have an indepth discussion with Bruno about my portfolio was invaluable and I would have been happy if that was all I learnt from the week..!! Would I attend another workshop..absolutely..with the right tutors. Everyone agreed it was a unique opportunity to really indulge and focus on your work, to shoot stories very different to what your used to shooting and completely absorb yourself in all things photography. 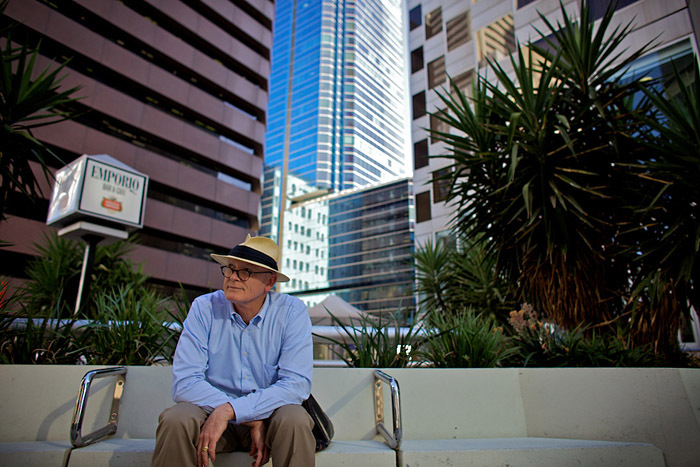 My original story idea was to report on newly arrived refugees in Perth and whilst all the agencies involved (ASeTTS, MMRC & FMCWA) were very supportive there just wasn’t enough time to arrange meetings with people and cover it in as much depth as I’d like to. 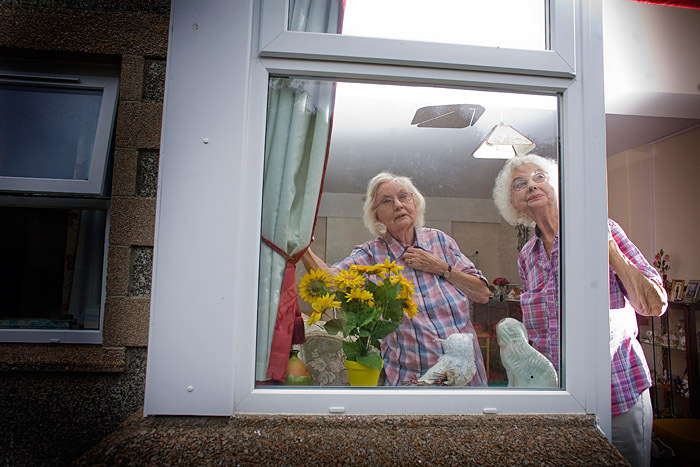 I did manage to meet a number of people who were both keen to have their story heard and be photographed so this will now turn into a long term project. 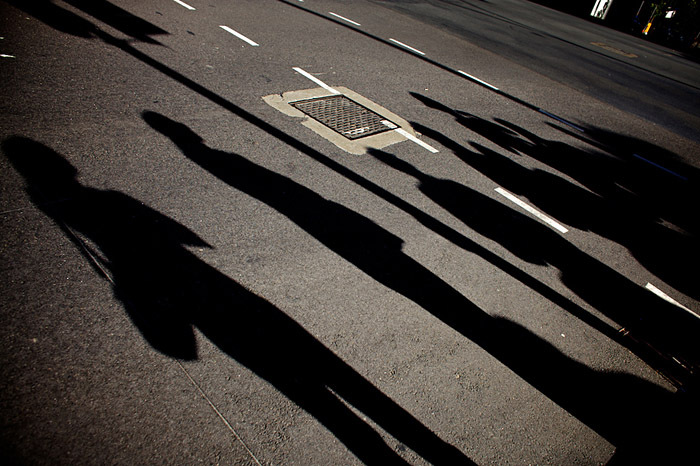 To keep shooting, I then decided to try out street photography and play with the amazing light. I’ve never really done this sort of work before but it was great fun and the light really is incredible in Perth. In addition to the workshop, the main festival FotoFreo 2010 and the Fringe exhibitions were opened on Friday night so with over 100 shows to see it’s going to be another busy week. There have also been some insightful seminars about blogging, book publishing and the photojournalism/art debate. I also had a very constructive portfolio review on Monday and have made some great contacts so it’s been a very productive time. 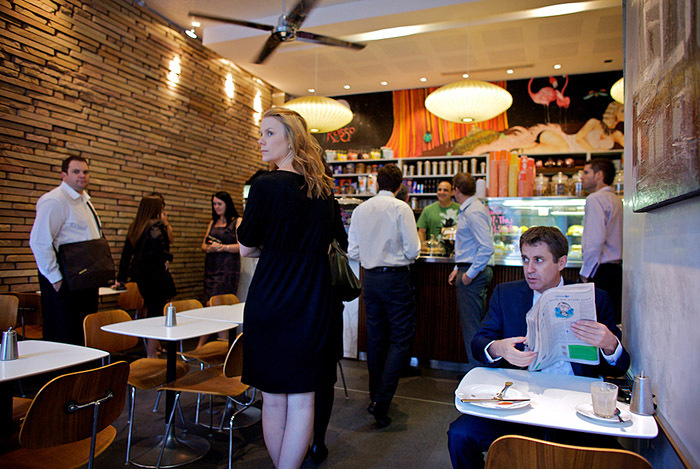 I would highly recommend visiting FotoFreo when it returns in 2012. Many thanks Bruno Barby and to all the staff and sponsors at FotoFreo, and Magnum for organising the workshop and granting me the scholarship. 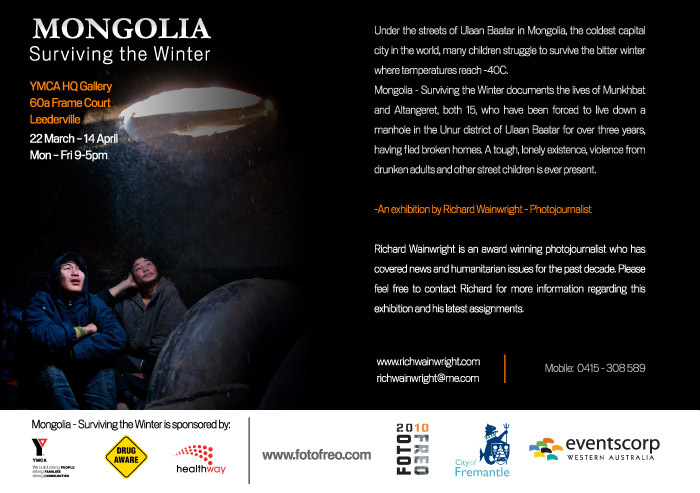 Only a week to go before I start hanging the Mongolia-Surviving the Winter exhibition as part of the FotoFreo Fringe Festival. What with the Magnum Workshop starting tomorrow and then a week of lectures, floor talks and documentaries it should be a busy but informative and very exciting few weeks. 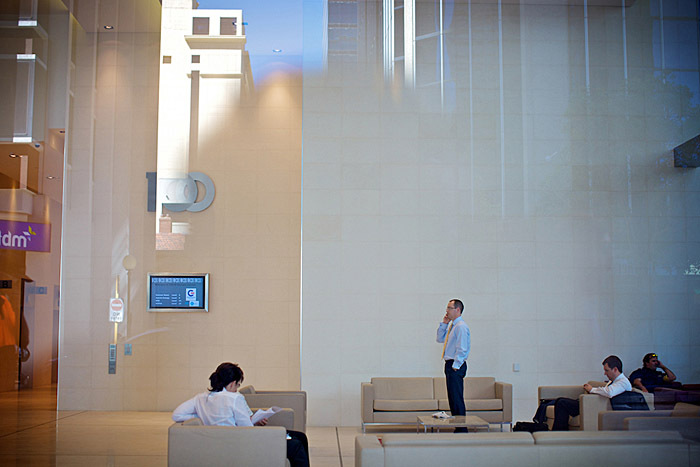 For full information about timings for the talks etc please check see the FotoFreo Programme. Below are the flyers I’ve prepared for the exhibition and the gallery location. Entry is free so if your in town and have time please drop by and see how these two incredible boys manage to survive. This assignment was quite unexpected and arranged at fairly short notice which made it all the more exciting. It was also my first assignment travelling from Australia so quite unusual to be checking in at Perth airport and flying to Bangkok then Kigali rather than just going back to London and Jersey..!! The aim of the trip was to give photographic coverage to 3 of the UK’s largest regional newspapers, the Manchester Evening News, the Liverpool Echo and the Yorkshire Post. Each had a journalist on the trip with the intention of reporting on CAFOD funded projects in Rwanda in time for fund raising events during Lent. I’d been to Rwanda once before but only very briefly stopping overnight on the way to the Congo so it was a great opportunity to go back and have a closer look. These days, virtually everyone knows Rwanda due to the genocide back in 1994 and it was the ongoing repercussions of this horrific event our reporting was to be based on. 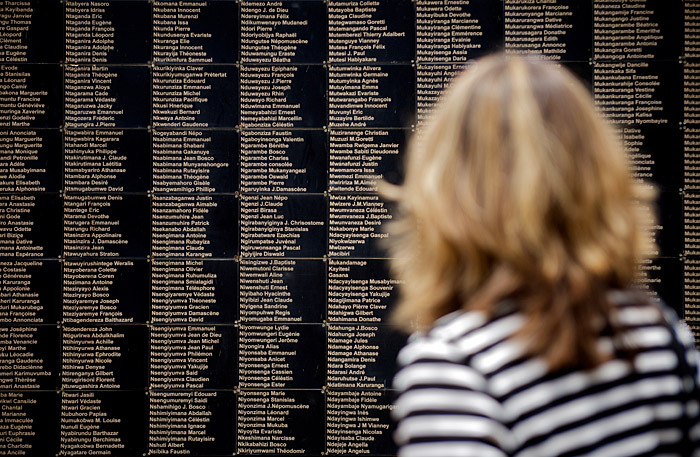 As a bit of background, over one million ethnic Tutsi and moderate Hutus were tortured and murdered during a 100 day rampage by the Hutu dominant government and its supporters. Neighbors, friends and even family members turned on each other. Children lost their families, women were beaten, raped and saw their families cut down in front of them. During our days there we interviewed a number of woman and orphans and they all spoke of the isolation they felt once the killing was over. With no one to turn to and no one to share their experiences with, the words, “I felt there was nothing to live for”, “I wanted to die” were repeated time and time again. With CAFOD’s support, local NGO, Avega East encouraged those with similar stories and living near each other to join together in associations. 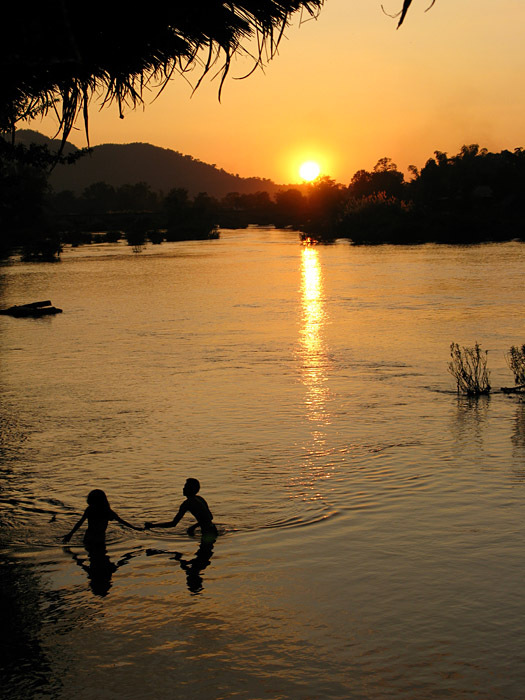 As well as providing trauma counseling on an individual and group basis, the charity provides small loans so the survivors can take control of their lives once again. Below are a few of the pictures taken during the trip. I’ll also be posting links to the articles written by the journalists. 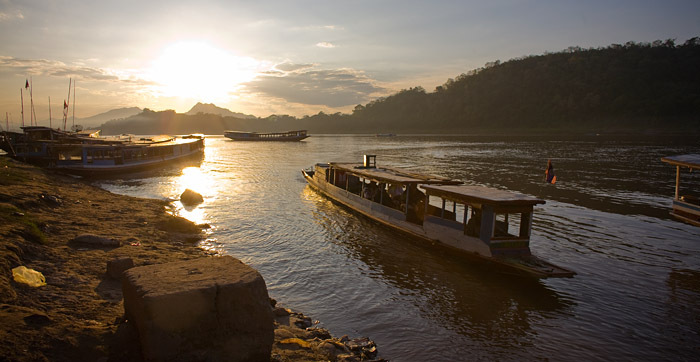 For further information about this and the rest of CAFOD’s work please click here. Names on the Kigali Genocide Memorial Centre. 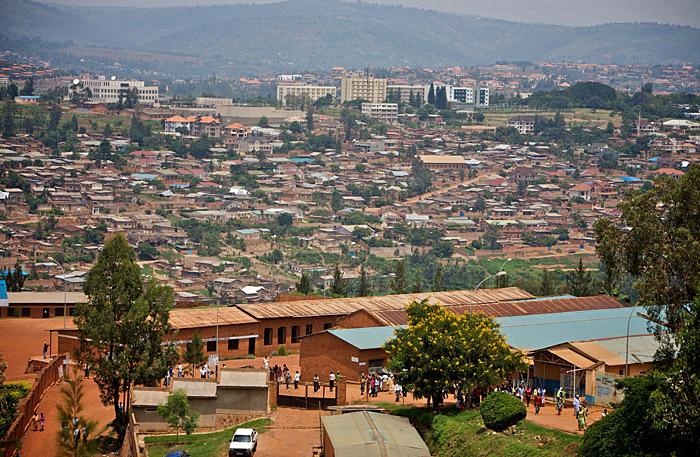 A view over Kigali, the capital of Rwanda. 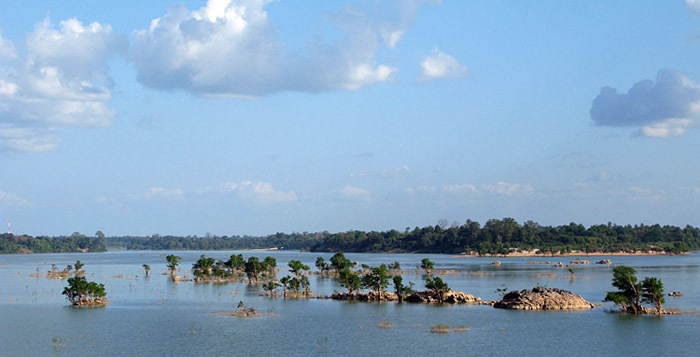 Now peaceful and one of the safest cities in Africa. 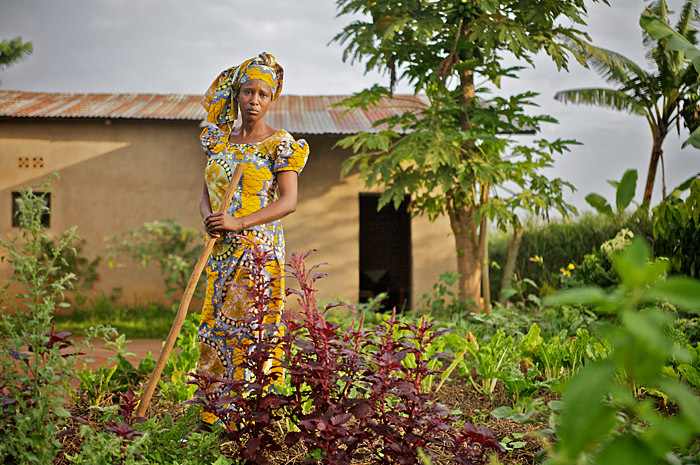 Joselyne Ingabire (43) in her garden at home in Rwamagana. 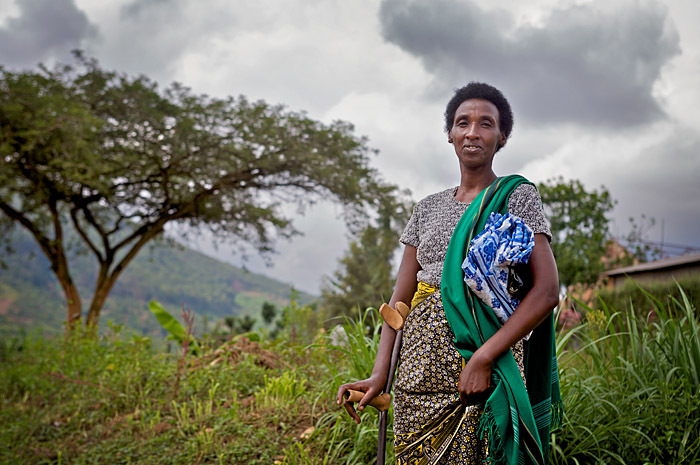 During the genocide her husband and family were killed and she was raped and became pregnant and caught HIV. She is now a volunteer counsellor with NGO Avega East. Collette Musabwasoni (47) lost her husband and five children in the genocide. 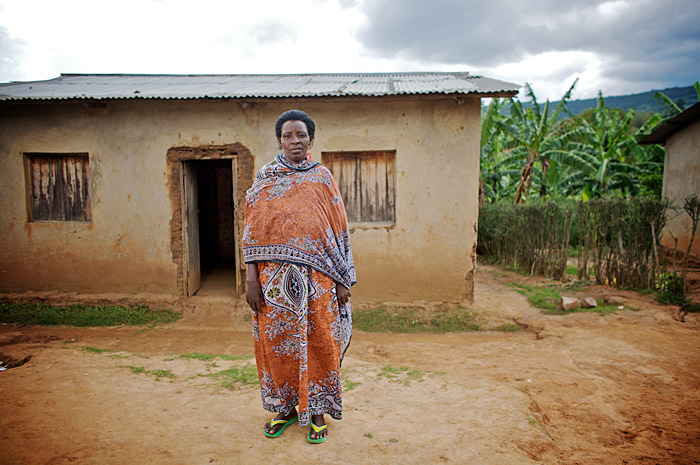 She nows lives in Nyagasambu Village where Avega East paid for 35 houses for genocide widows. She runs a food stall business paid for by micro credit. 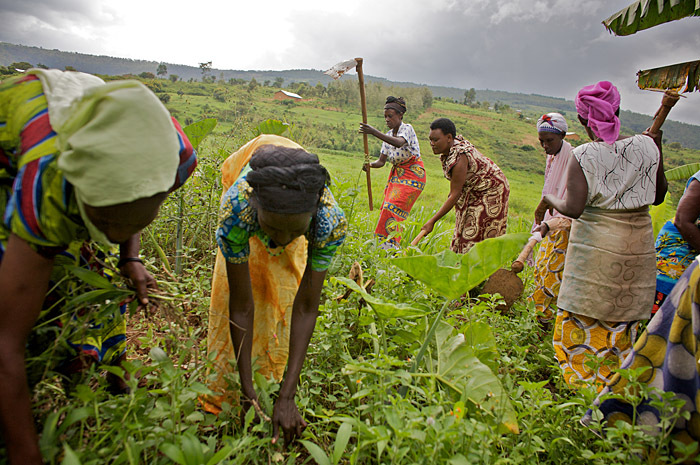 Widows tending their banana plantation in Nyagasambu Village where Avega East paid for 35 houses for genocide widows. 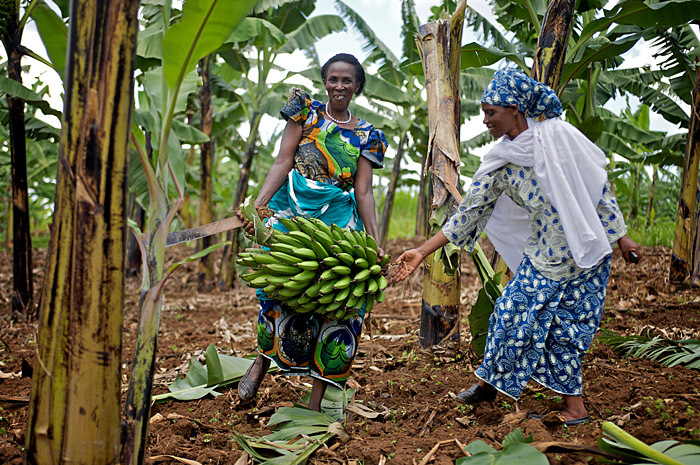 They are assisted by micro credit programs enabling them to grow bananas to both eat and sell. Kiramuruzi sector Abishyize Hawiwe Cooperative who are helped by Avega East to grow bananas. L-R Mukabutare Theopiste & Mukamutara Phelomene carrying bananas. I’ve just heard some great news..! 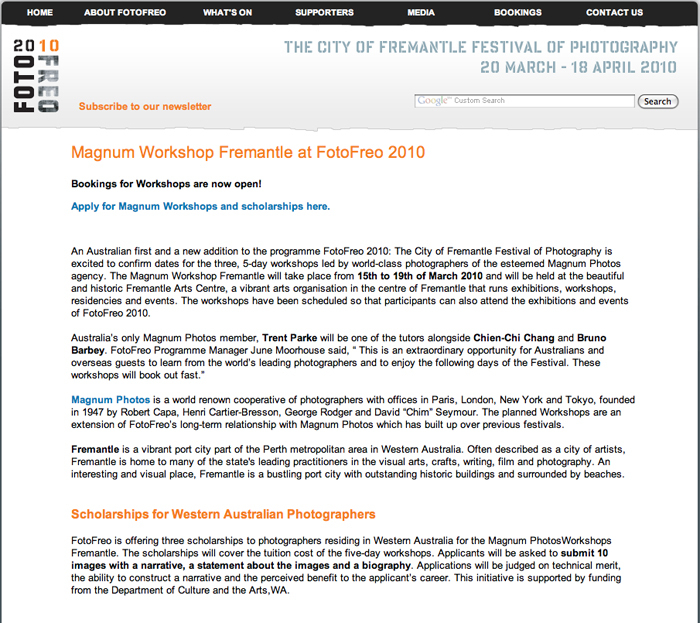 I’ve been awarded a scholarship to attend a 5 day Magnum Workshop Fremantle which is headlining this years FotoFreo 2010: The City of Fremantle Festival of Photography. This is an incredibly exciting opportunity and really couldn’t have come at a better time in my career having just turned freelance. I submitted the Mongolia story as part of my application but the written statements took quite some time to prepare. I’ve always been interested to know how other photographers gained grants or scholarships so I’ve copied my entry below. I’m certainly not saying this is a model application by any means but it may give other photographers an indication to what is needed. Every admission guideline and photographers history is different but hopefully this will give you an idea of what could be included in your statement. What I have had reinforced is that you never stop learning. Moving into a freelance environment brings many new challenges from setting up your own computer system to branding and business knowledge. Then there is marketing and developing your own personal style. Each newspaper has its own house style but when you become freelance you can really start putting your own signature to your work that evolves over the years. The Magnum course will give me the opportunity to concentrate my mind and give me more focus and direction which is invaluable. 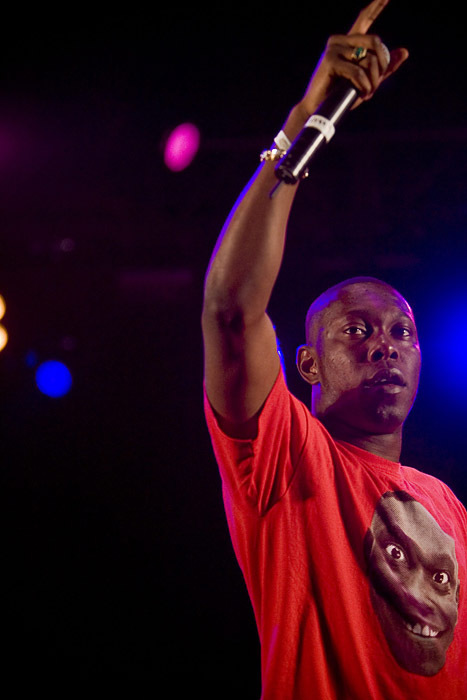 I’ll keep you posted with any new updates…. How will this opportunity benefit your career ? 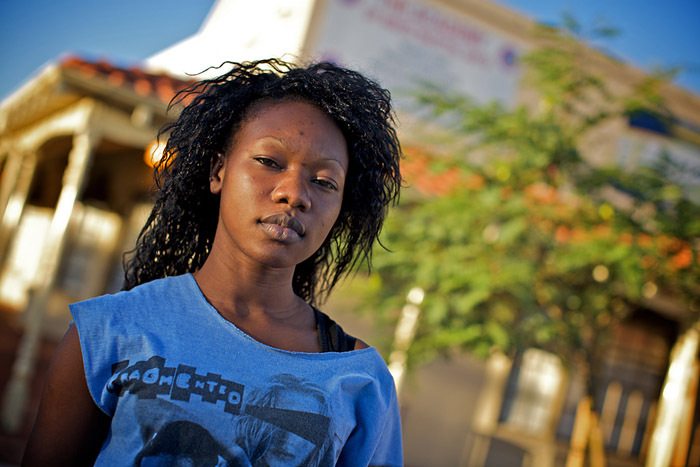 This course starts just at the time of an exciting and major changing point in my photojournalism career. I have recently left my job of 8 years with a UK newspaper and I am about to embark on a freelance career, which I hope will bring greater freedom, creativity and meaning to my work. I am also about to undertake my first long term project. The opportunity this course offers to receive guidance and advice about the dynamics, evolution and creative changes of how a long term project evolves would be invaluable to me. I thoroughly enjoyed and learnt a great deal working for the Jersey Evening Post, however my true passion is documentary photography and reporting on humanitarian issues. During my time at the paper I used all my holiday time and unpaid leave to go on self assigned and commissioned projects. Whilst I have had a very positive response to my work and received a number of accolades I feel I have much more potential to fill. 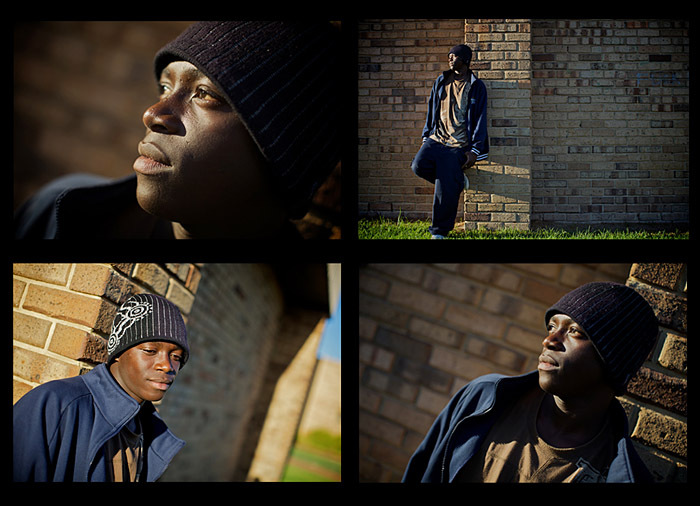 My commitment to photojournalism is as strong as the day I started and I believe I would greatly benefit from receiving advice about refining my style, being taught stronger editing skills and having the opportunity to learn new camera and technical skills. The chance to interact with such established photographers, seeing and learning how they work, operate and conduct themselves would be invaluable as well as being able to discuss and debate contemporary photography practice with other photographers. This would be my first formal training environment since leaving university and I would relish the intensity and opportunity that this course offers. Once again, it’s been awhile but believe me, behind the scenes I’ve been very busy..!! I haven’t actually shot many pictures which is a bit frustrating but as many of you know, a lot of time is spent sorting out computer systems, archives, marketing, research and everything else that goes into creating a new business and organising foreign assignments so thankfully getting out there and doing what you are supposed to and love doing is just around the corner. Good progress is being made and I’ll hopefully be posting about some very exciting new projects coming up in the near future so watch this space…!! As for now, I thought I’d let you know that an image from a shoot I did last year for Rotary Jersey has been awarded Nominee status in the 5th Annual black and White Spider Awards. I’m certainly more of a color shooter and this was my first black and white project I’ve shot in quite some time so it was a pleasant surprise for it to be recognised. 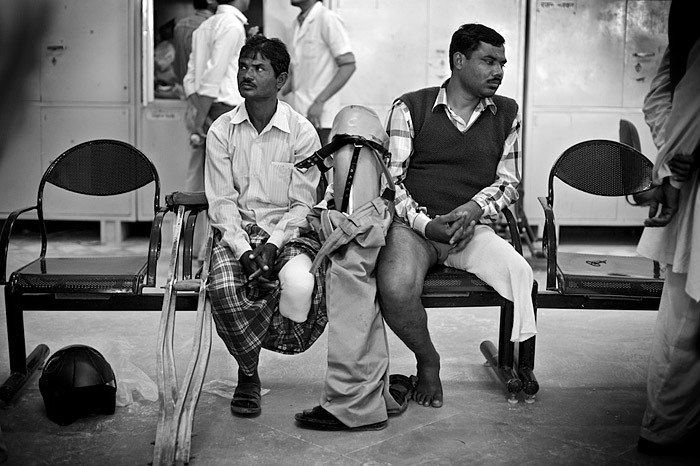 The picture was part of a series I did at Jaipur Foot in India. You can see the whole series and text here but basically Jaipur Foot is an incredibly inspiring Ngo set up by the highly energetic and dedicated D.R Mehta. Every day, hundred of people from all over India travel to Jaipur to receive artificial limbs and polio survivors are given tricycles or calipers. All of these services are given for free and it’s literally a lifeline for thousands of Indians who from here can start making a life for themselves with their new found mobility. I only had two days there after shooting the polio eradication story but found the atmosphere positively infectious. 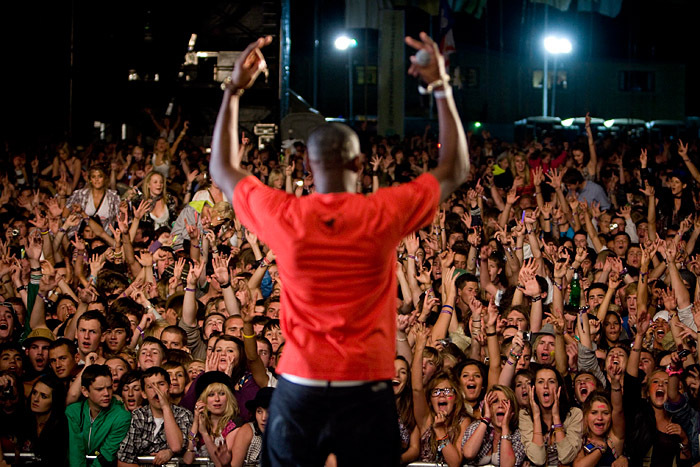 In a matter of hours you saw peoples lives transformed. 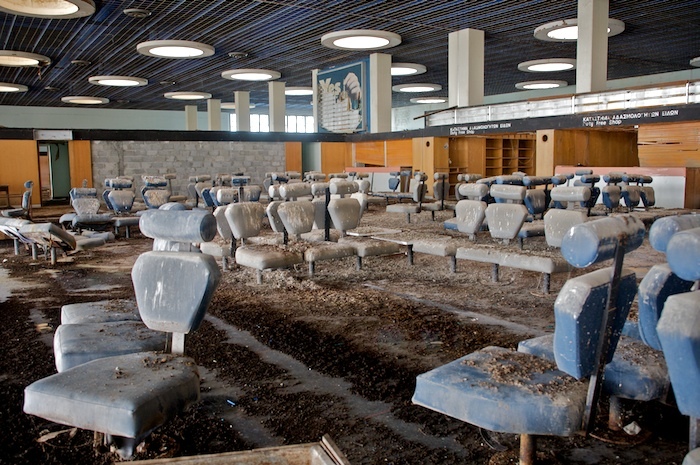 The image below was shot in the fitting centre where people wait for the limbs to be made. The guy on the left lost his leg in a train accident (most amputations are caused by train incidents) and on the right is an army officer with his new artificial limb next to him. What I liked is the fact all limbs and fittings are completed in an open room so patients can see exactly what is happening. You can see on their faces they are apprehensive but by having everything open the whole process is hopefully demystified. The selected final images are, as always, of a very high standard. It is interesting to note maybe that the vast majority of images are either black and white or desaturated images..maybe this is what the majority of entrants submitted or it reflects the preference of the judges or maybe an indication of what Spanish photojournalism prefers..? It’s been just over two months since I last blogged..seems like 5 minutes but much has happened inbetween. Terese and I finally made it to Australia after a hectic last month in Jersey preparing to leave . Thankfully all my computer equipment, hard drives, books and everything else a photographer needs to work with turned up intact in Perth just after we arrived which was a great relief..! 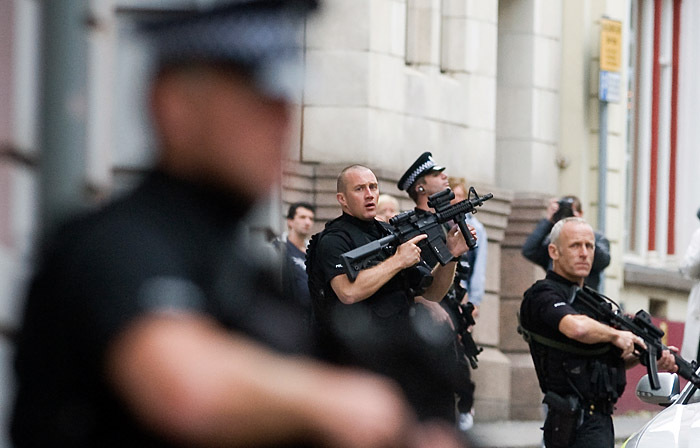 The only problem I had was my body armour has been seized by Australian customs who have become all excited over it. Still negotiating this a month later so any suggestions welcome..!! Will update some more a bit later but this really is downtime so don’t expect much..what can you shoot on a beautiful Thai beach anyway..!! It’s been a while since the last post but a lot has been happening…. By far the most important and certainly the most exciting is I took voluntary redundancy from the Jersey Evening Post and I’ll be emigrating to Perth in Western Australia in about 5 weeks..!! It was a tough decision leaving a fantastic full time newspaper job (during a recession..!!) 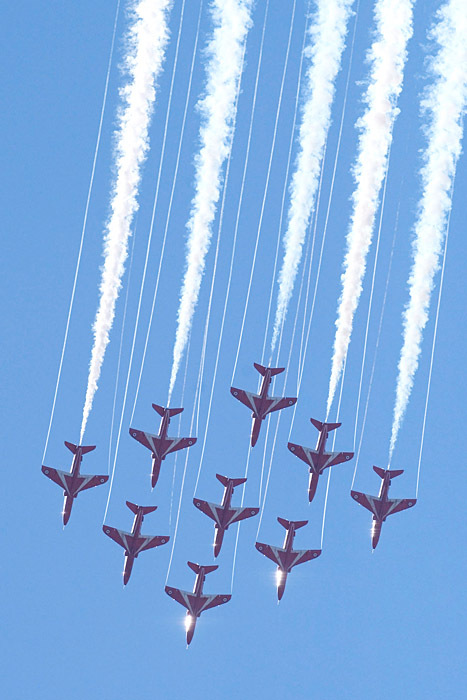 but the time was right and my wife Terese was keen to return home. It’s going to be a steep learning curve setting up a new photography business and all the hassles of being freelance but it will be a great challenge and hopefully rewarding. The plan is to concentrate on my foreign assignments and humanitarian work over the next few years and also make contact with the various newspapers over there..I’m still very much a newspaper photographer at heart..! The last 8 years at the JEP have been amazing. I was incredibly fortunate to be offered the job in the first place. There is very little movement in the department so when a position comes up it is always hotly contested. I had little experience then but bags of energy and enthusiasm which sometimes counts for a lot. I’ve leant an enormous amount and the opportunity to work on foreign assignments as well as the day to day work was great. I’ll keep you updated with any more news but for now it will be the occasional freelance job and lots of packing..!!.. Well, I’m really pleased to announce that I heard today that I’ve won the Association of Photographers Open Award for a recent assignment in Mongolia. There was an awards night in London last night which unfortunetly I couldn’t go to because I was on shift but it would have been great to be there. 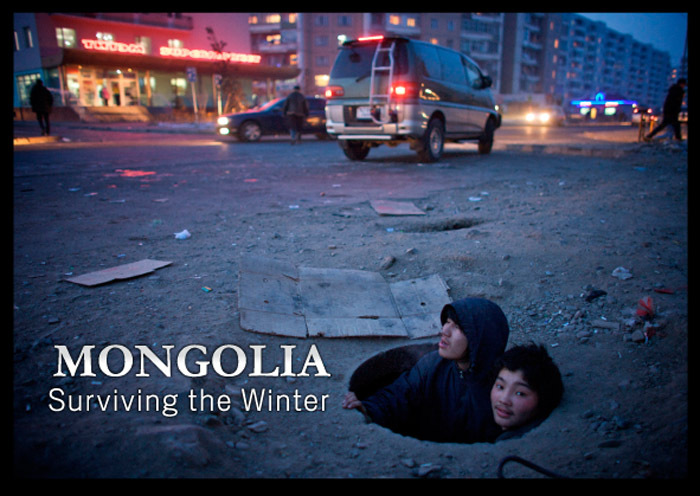 This was a very personal project for me so I’m happy that it’s been recognised by a wider audience and hopefully through this competition more people will have an understanding of what many children are experiencing in Mongolia. If you are interested in this subject, please have a look at this aid agency in Ulaan Baatar who I met and who are doing a great job trying to help people just like Munkhbat and Altangeret. The Christina Noble Children’s Foundation.